Local Community Bike Repair Kiosk Now OPEN! The brand new public access community bike repair kiosk is now open!! I’m very pleased to have provided City of Winnipeg funding support to the U of M Cycle Bike Kiosk ! This brand new bike repair kiosk is located on the grounds of the University of Manitoba behind the Active Living Centre. The kiosk is a showcase project led by the University of Manitoba Students Union and I am extremely proud of their leadership on this project! BRAVO! This is the first summer the community bike repair shop will be open, offering a wide range of cycling services. There will be a professional repair service complete with a wide selection of parts and accessories to purchase. The kiosk will also have free tools available for anyone to use to fix your own bike! This is a spectacular addition to our community! Now let’s get those bikes tuned up and hit the trails! Learn to fix your bike for free! Pick up your FREE bike map at the Kiosk and explore the many trails! Thanks to Canstar Community News for covering this story. The crew at the University of Manitoba’s new bike kiosk is gearing up to get cyclists on the road this spring. 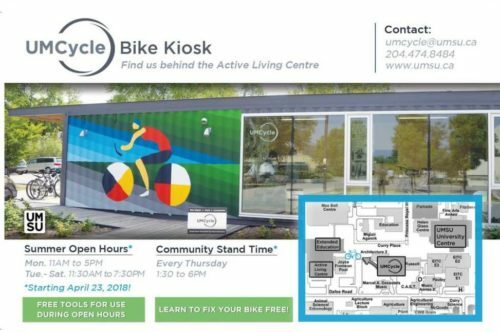 The UM Cycle kiosk, located behind the Active Living Centre in the Migizii Agamik Plaza on the Fort Garry campus, officially opened on April 23 for its first full summer season since the grand opening in September 2017. The nearly $294,000 kiosk and courtyard space provides community and campus members free access to resources related to bike repair and maintenance. During opening hours, tools are available for cyclists to do their own repairs, staff and volunteer mechanics are on hand Thursday afternoons to walk cyclists through more complex jobs, and new and used parts are also available to purchase from the kiosk. The bike shop is operated by the University of Manitoba Students’ Union and received funding from the City of Winnipeg, federal government, and the university. 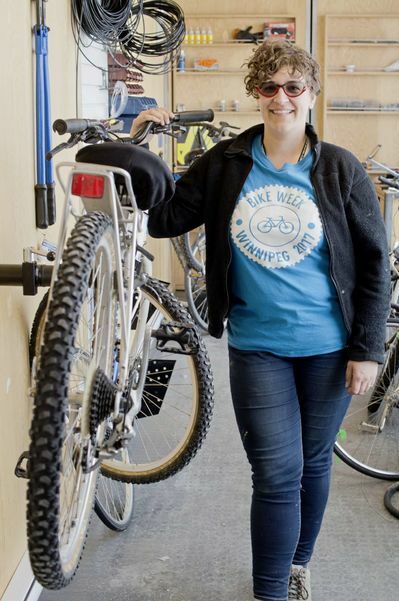 Anna Weier, manager of UM Cycle, said the initial reception to the shop — which operates out of retrofitted shipping container — has been positive and she’s looking forward to a busy cycling season in Fort Garry. “We definitely have a lot of people who come from outside of the U of M campus,” Weier said. “Last year, we were just feeling things out, so our hours were probably not very helpful to people who live off campus because we were open only in the middle of the day, when most people were at work. The kiosk is currently staffed with two full time and two casual employees, based on need, and also has a large volunteer complement. 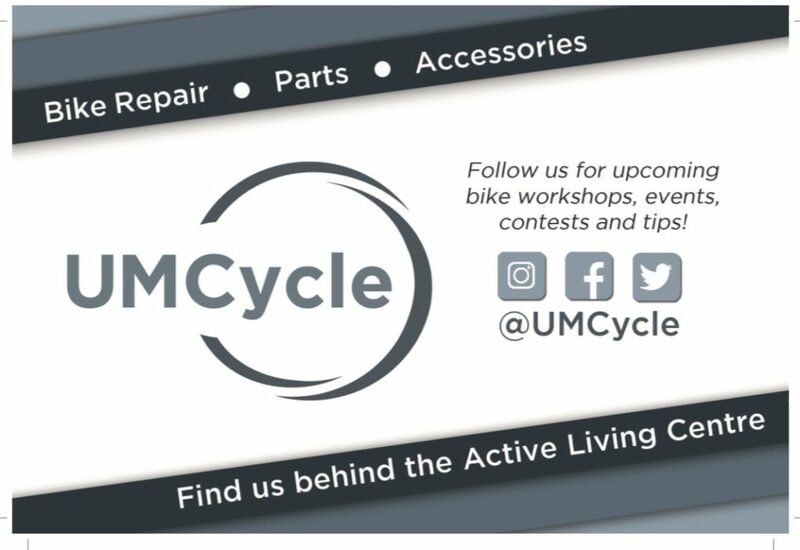 When the UM Cycle folks aren’t helping out stranded riders, they also run bike repair workshops for community groups and refurbish abandoned or salvaged bikes. Bikes that are left on campus will be headed to the kiosk, along with frames rescued from the dump, where they will be repaired by UM Cycle staff and sold at the U of M for $50 to $250 to support the program. “We’re operating as a social enterprise so we’re trying to make enough money to cover our costs. Whatever money we make goes back into our operations,” Weier said. Community members also have an opportunity to build their own bike through UM Cycle. For a suggested donation of $50 (or pay-what-you can), people can draw on the experience of UM Cycle staff and volunteers and build a bike with used (and some new) parts. “So people can have a good bike that’s not super expensive and also to help us cover our costs so we can continue operating,” she said. A few additional grants have also allowed the bike repair shop to increase its footprint this summer. The U of M, UMSU, and the faculty of architecture along with others have supported a $35,000 expansion that will see new storage, work, rest, and display areas constructed by fourth year environmental design students. A signage and wayfinding component will also be part of the project. Lancelot Coar, an associate professor of architecture at the U of M, is leading students through the design-build project, which sees them actually take up hammer and nail to bring their visions to reality. “Because we’re in Migizii Agamik Plaza, we worked very closely with the elders at Migizii Agamik to develop signage that incorporates both traditional land use, traditional names of landforms, locations and sites, with contemporary maps of the city and city and campus resources,” Coar explained. The expansion is expected to be finished by the end of summer.